Evening Class | Aren't You Rather Young to be Writing your Memoirs? 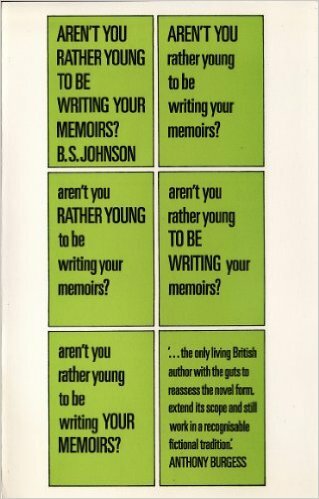 On Thursday 5th January 2017 we will be reading the Introduction to B S Johnson's Aren't You Rather Young to be Writing your Memoirs? The text is about how art (specifically BS Johnson's field of writing) is outdated if it doesn't find forms that either match new methods of communication and media, or offer what other media can't. He then discusses formal inventions that he has introduced to try and represent reality more accurately. Our readings and talks on Thursdays are free and open to all, and are held at 48 Aberfeldy St, London, E14 0NU unless otherwise specified.